Canadian Yearly Meeting of the Religious Society of Friends met for the 182nd annual gathering of Quakers in Canada, our 60th as a united Meeting, for the first time on the beautiful campus of the University of Prince Edward Island in Charlottetown. We came knowing that we had many challenging discussions to have and decisions to make. The pre-gathering retreat, Nurturing Joy in our Meetings, was led by Lesley Read of New Brunswick Monthly Meeting and grew out of silence. Participants moved into small group work and consideration of joy in all facets of our lives. On Saturday Friends gathered from all across Canada and celebrated community together in the evening. We were welcomed to the traditional Mi’kmaq territory of Abegweit by Indigenous Elder Judy Clark. On Sunday afternoon, we celebrated the lives of those who died in the last year. That evening we heard the Sunderland P. Gardner lecture, titled Decolonizing Land and Soul: A Quaker Testimony, presented by Alastair McIntosh, Scottish Quaker and activist of Glasgow Area Meeting of Britain Yearly Meeting, whose words were challenging, humorous and thought-provoking. He continued his themes with workshops during the week. The lecture was followed by the traditional ‘cakenight’ in celebration of our beloved Archivist, Jane Zavitz-Bond, who is moving toward release from her long service. Deborah Fisch of Friends General Conference and Iowa Yearly Meeting (Conservative) led us in Quaker Study titled The Joy of Meeting for Worship with Attention to Business, with depth and humour. We began our regular week of activities, with Meetings for Worship with Attention to Business, as our Quaker Studies leader has reminded us to call it. An important session took the form of an extended Meeting for Worship with attention to the future of Quakerism in Canada, and the future of our Canadian Yearly Meeting’s functions. We proposed major changes to our structure. We are anticipating a fallow year in 2017 during which we will not meet as Canadian Yearly Meeting in session. We were tested, being unable to reach unity in this matter about which many felt deeply. We remain committed to seeking the spiritually rich and financially-sustainable Yearly Meeting we desire. We learned with sadness of the laying-down of Simcoe-Muskoka Monthly Meeting in Orillia, Ontario, and welcomed with joy the birth of Cowichan Valley Monthly Meeting on Vancouver Island, British Columbia. Afternoon programs consisted of worship groups, followed by a wide selection of Special Interest Groups. One afternoon, we took part in community service projects proposed by our hosts, Prince Edward Island Worship Group: labouring in a nearby community garden and tree planting in a river watershed. Funds saved by a simple supper were donated to the university food bank. The week continued hot and humid, and many Friends enjoyed the glory of God’s Creation in salt water on nearby beaches. Our evenings were filled with interesting activities. “The Experience of the Spirit in my Life”, an annual opportunity for Friends to share spiritual journeys was moving, with Friends sharing sometimes unusual experiences. There was a Lesbian-Gay-Bisexual-Transgendered-Queer (LGBTQ) sponsored film presentation, entitled My Prairie Home, and discussion. Another evening, we were led in considering communication and outreach in times of changing technology, finances and demographics. Our youth numbers were small but Young Friends particularly loved the sun and activities of Canada’s smallest Province situated on an island in the Gulf of St. Lawrence. Because the group consisted almost entirely of Young Adult Friends, youth joined in on much of the adult programming, including attending Meeting for Worship with Attention to Business meetings, Quaker study, worship groups, Special Interest Groups, and evening activities. Youth-specific activities involved Canadian Young Friends Yearly Meeting for Worship with Attention to Business, excursions to beaches, late-night brownie baking, a dance, to which we joyfully welcomed older Friends as well, and drawing games. Some Young Friends and Young Adult Friends also enjoyed volunteering with the Children’s Program. On our last evening together we enjoyed the various gifts and talents of many Friends young and old during our annual family night. The ministries of music, dance, and laughter nourishes us as we prepare to leave this blessed community. We are grateful for the setting here but recall the unusually severe wildfires in western Canada and the dangers these pose to Western Friends and to Mother Nature. We urge Friends to work ceaselessly, including with faith-based groups around the world, to mitigate and adapt to the challenges posed by changes to Earth’s climate. Although it was a week spent in serious work and in considering and making decisions, it was also a week during which Joy was a recurrent theme. We approach the coming year spiritually refreshed and full of hope and expectation. Who Says all You Do at CYM is Sit in Meeting for Worship with Attention to Business? After nearly three rather sedentary days at Canadian Yearly Meeting, mostly in meetings, Wednesday afternoon was a welcomed break. This was our service project time. This year we were offered a choice of two activities: tree planting or helping out at the Charlottetown Farm Centre Legacy Garden. I chose to work at the Garden. The entire Garden covers an area of ten acres. The one-acre production area of the Garden supplies the food bank, homeless and women’s shelters with organic produce. The neighbouring acre of land is divided up into community gardens, lovingly tended by some 80 gardeners, who supplement their diet in this way. Further afield orchards are being set up. About seven or eight adult Friends, of a wide range of ages, set off to the Garden on the 10-minute walk down the Trans-Canada trail in the mid-afternoon sun. We were then joined by some of the children participating in the children’s program. After a short introduction to the Garden, we were shown some very long rows of beans and asked to pull out the lamb’s quarters and the mustard but ignore the other weeds. These two plants towered above the beans themselves, some being almost as tall as the smallest children, preventing the beans’ proper growth. The mustard was also rather deep-rooted and quite a tussle to pull out. It was hard for the gardeners among us not to disobey our instructions as we were tempted to also weed out the thick growth of weeds around the base of the bean plants. When our time was up, we watered some drooping squash growing out of bales of straw and then liberally sprayed ourselves with the hose pipe to wash off the dry dusty red PEI soil. We straggled back down the trail, late for supper, but at least feeling that we had fully earned it. Wednesday supper at CYM is a simple meal. This is the third CYM at which there has been a simple supper, which is part of a charitable project. The idea is that Friends are offered plain fare but pay the regular price. The money collected then goes to a charitable organization. In this case, PEI Friends chose the charity. The meal – lentil stew and an orange – was not only simple, but also tasty, especially to the famished gardeners. A ripple of laughter went through the floor when our Clerk asked whether we wished the Contributions Committee to continue its functions. Isn’t that a given? Perhaps this was her ingenious way of focusing our attention on a matter many Friends try their best to avoid: filthy lucre, mammon or, in plain English, money. Yet, it’s simple: we can only do as much as our funds allow. Two hundred and thirty four people donate to CYM regularly. That means that 80% of Canadian Quakers do not donate to CYM. For several years now, our Treasurer and our finance people have been hammering home to us that the current level of donations to Canadian Yearly Meeting is insufficient to sustain its present level of activity. We have tinkered with our activities. In the view of some, and much to their grief, we have even tampered with them drastically( e.g., by switching to online documents and publications). We are on the way to a spiritually rich and financially sustainable Yearly Meeting, but we are not there yet. Thus, the question is, how can we convey the benefits of CYM to Friends across the country? Communications are key, and the fact that our Clerk is now sending regular letters to Monthly Meetings and that CYM is sending personalized thank you notes to donors is to be welcomed. In order to get the contributions process rolling again, the Clerks are to call the next Contributions Committee meeting, and the nominating Committee is to seek two more Friends to serve on it. For all who feel inclined to dismiss the call to serve on Contributions Committee, please note that its members do not knock on doors or even necessarily make soliciting phone calls. Much of their work involves devising effective methods for reaching out to Friends, in other words, communications are key. Hence, this is an invitation to revitalize the Contributions Committee, which is so central to the work that we do on a daily basis. As Friends contributing to this committee whether it is financially or through service is essential for the sustainability of CYM. Pass on the word to your Monthly Meeting or Worship Group! The highlight of the Canadian Yearly Meeting (CYM) on Sunday and, to many, the highlight of the entire 2015 Yearly Meeting gathering, was the Sunderland P. Gardner Lecture by Alastair McIntosh. 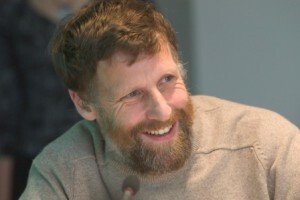 Alastair McIntosh has been called an ecowarrior due to his ecological activism. Elaine Bishop, our Presiding Clerk, described him as an “uncomfortable Friend.” She also compared him with an Old Testament prophet because he was bound to make us feel discomfort. Alastair McIntosh grew up in a close-knit community in Lewis, a remote island in Scotland. The theme of his talk was colonization in what we now know as the United Kingdom. He ran through a brief history of land evictions, starting with the Highland Clearances in the 18th and 19th centuries, and the Irish famine in the mid-1880s, which resulted in some one million deaths. Land, originally a Divine gift, a source of community, and the very source of life, was commodified. This colonization process was continued when the native peoples of overseas lands were evicted, driven into reservations and, in the case of some tribes, exterminated. Those evicted by the British in the British Isles had no choice but to become oppressors in turn, displacing native peoples. This process represents the replacement of soul by the rational. Alastair has worked with the poor in a disadvantaged area of Glasgow, an area he considers parallel to an Indian reservation. In the 1990s, he successfully defended Lewis and Eigg against gigantic development projects. In the latter case, he and his fellow campaigners were instrumental in averting the stripping of a mountain to build a vast network of roads in England. To achieve this result, Alastair worked with a group of activists to create a great stir in the media, with headlines along the lines of “God’s mountain desecrated.” Alastair’s negotiations with and protests against Lafarge, a French industrial company specializing on construction materials and planning the project, resulted in him working for 10 years with the company, on a range of issues related to environmental sustainability. His expenses were paid but he did not receive a salary.